Written in 1974 and newly translated by Roger Allen, the novel takes place in the mid-1960s and focuses on the Karnak Café regulars as they respond to some key moments in contemporary Egyptian history. 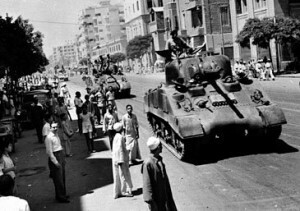 For the young people, “history began with the 1952 Revolution,” in which the army, led by a young officer named Gamal Abdel Nasser, overthrew King Farouk, abolished the pro-British monarchy, and established a republic, inspiring other Middle Eastern and north African countries in an Arab sovereignty movement. 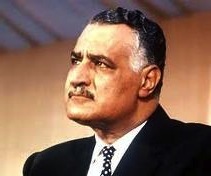 In 1954, Nasser became President of Egypt. Hopes were high then and continue to be high for the young at the café in the early 1960s, despite the acknowledged (and continuing) problems with civil rights, poverty, and abuses by the police. The three young people and their fates become the focus of the narrator when the young people inexplicably disappear for several months. One of them, Hilmi Hamada, has been the lover of Qurunfula, a love relationship which has given her life new meaning. Hilmi, his friend Isma’il al-Shaykh, and Isma’il’s love, Zaynab Diyab, have all been arrested, supposedly because they are involved with the fedayeen movement, a militant Islamic movement which might threaten the current government. After several months of incarceration under deplorable conditions, which they describe after their release, they are found innocent, and they try to continue their previous lives—until they are arrested and imprisoned again, this time on the suspicion that they are Communists. 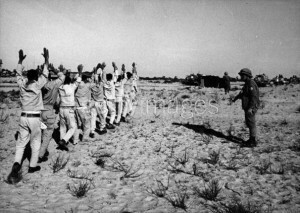 Gamal Abdel Nasser, their President, has been involved in the formation of the Palestine Liberation Organization, and when the PLO begins to challenge Israel militarily, and the problems escalate, the scene is set for an Egyptian incursion to protect the Sinai, resulting in the Six Day War in 1967 with Israel. The three young people from the Karnak Café are imprisoned during this time, and when they are released, following Egypt’s defeat, they are devastated, their hopes for their future dashed. “All of us need time so we can bandage our wounds and purify the collective national soul,” Zaynab says. 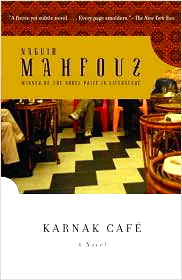 Mahfouz develops treme ndous suspense about the eventual outcomes of the regulars of the Karnak Café, at the same time that he creates an intense look at the pressures placed upon them as they try to live their lives and do what they think is right. 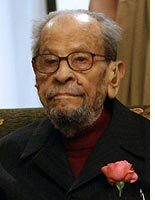 As the forms of torture the young people undergo are revealed, the taboos of the society become obvious, and the faith of the young people in the future of the revolution of 1952 is put to the test. The progress of the country is obvious through their comments, at the same time that the limitations of the country, obvious through their treatment by the military and police, are even more obvious. The desire for “freedom” never flags, at the same time that the powers that be consider “freedom” to be dangerous because of the potential for growth of the fedayeen, the communist movement, and socialism, which would threaten national security. Ultimately, they must consider whether “peace is more risky than war.” As they and others investigate religion as the answer, then communism, democracy, socialism, and war as the “answer,” they must also consider whether negotiation with the great powers, especially America, might lead to peace. Their individual lives, shattered by their arrests and imprisonments, cease to exist in the aftermath of the trauma, and their ability to trust is gone forever.